We talk to military historian Padraig Lenihan, author of 1690: Battle of the Boyne, about the most famous Battle in Irish History. By John Dorney. Listen to Padraig Lenihan on “three inter-locking contexts” to the Battle, below. See also, the Jacobite Williamite War, an overview. 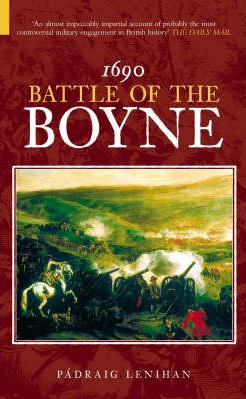 The Battle of the Boyne it is often said, was fought in Ireland but was not an Irish battle. And to an extent, this is true. What was at stake at the Boyne was the throne of England, fought over by James Stuart and William of Orange. William, Stadtholder of the Netherlands, had landed in England with a Dutch Army the previous year and deposed James II, with the connivance of elements of the English Parliament. There was more to it than that, however. For Irish Catholics, the reign of the Catholic James II had meant a chance to recover their position in society – lost in the Cromwellian Wars of the mid 17th century. Under James, Catholics regained the right to hold public office and to bear arms . By fighting for their deposed King, they also hoped to win autonomy from the Parliament of England and even to recover the lands confiscated by Cromwell in the 1650s. Protestants in Ireland, naturally, fought for the Protestant William to maintain their own advantages in Irish society, but also because they saw the Jacobite regime as hostile, and potentially as one that would massacre and drive out the Protestants from Ireland. On top of this, there was an ethnic dimension to the war – since most Protestants in Ireland still regarded themselves as English or Scottish. What was more, the Boyne was also an international battle. William wanted to be King of England in the first place to get England into his Grand Alliance against Louis XIV of France. The Williamite ranks at the Boyne were filled with Dutch, Danish and German troops, while the French sent troops and technical advisors to help James. 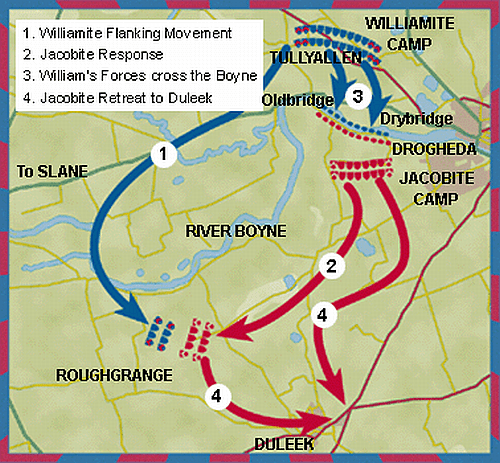 The Battle itself was James’ attempt to block the Williamites march on Dublin from the north at the river Boyne. The Williamites, superior in numbers and equipment, forced their way across the river, but did not manage to trap the Jacobites, whose army retreated intact. Here we discuss why the battle came to be fought there, who won and why. Padraig argues that, although not terribly bloody and not militarily decisive, the Boyne had enough political significance to make James despair, give up Dublin and flee the country. It was not enough to end Jacobite resistance in Ireland, however, which defeated an attempt to storm Limerick and was not squashed until the Battle of Aughrim the following year. We also discuss class tensions in the Jacobite ranks and why William’s army was welcomed as liberators in Dublin. Not many 300-year-old battles are still commemorated every year. Here we discuss why the Boyne has had such symbolic resonance. Orangemen march in commemoration of the Battle on July 12. Padraig Lenihan suggests that the imagery of the Boyne imbued it with, “a certain glamour” –at the time and later. Two Kings, separated by a river, fighting for Three Kingdoms. One, William, was brave and victorious, the other, James, was cowardly and fled defeated, this is the stuff of which legends can be made. More than that, the Boyne came to represent for the “whig” liberal tradition, the triumph of, “religious and civil liberty” over absolutism. In the aftermath of the “Glorious Revolution”, the Parliament of England managed to wrestle much more power from the monarch than ever before. We discuss the validity of this interpretation. 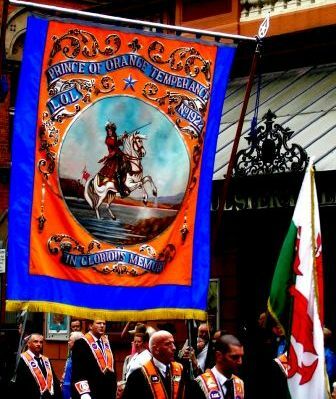 Finally, the memory of the Boyne is kept alive by the Orange Order, which marches every 12th of July in honour of the Williamite victory there. We discuss the connection between the Order and the actual events of 1690. The Boyne came to prominence rather late in Protestant commemorations. In the 1600s, the most important anniversary was October 23 and the memorial to Protestant victims of the Irish rebellion of 1641. Later it was the 1691 Battle of Aughrim and only in the late 1700s did the Boyne become dominant. Padraig argues that the roots of Orangism lie much more in sectarian conflict in 1790s Armagh, between Protestant Peep of Day Boys and Catholic Defenders, than in the war of the 1690s. These two rival gangs fought over control of the new weaving industry in rural Ulster, the Orange Order being born out of the Peep of Day Boys. *Note, the original date of the Battle of the Boyne was July 1st, 1690, but due to the change from the Julian to the Gregorian calender, it’s anniversary fell on July 12 after 1752. The Twelfth commemoration originally referred to the Battle of Aughrim, fought on July 12th 1691. Written by: John_Dorney on 12 July, 2010.on 11 July, 2018. 5 Responses to "Today in Irish History -The Battle of the Boyne, July 12."